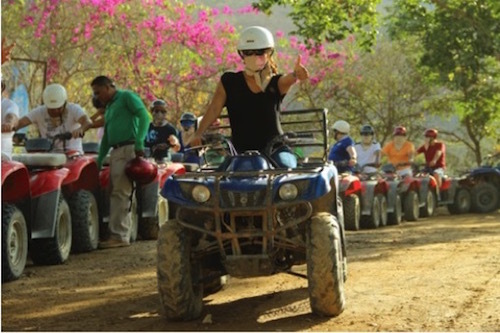 Onboard an ATV you will rejoice through unknown trails of the amazing view of the Sierra Madre Canopy River Surroundings. We will make a stop in a wonderful crystal waterfall where you can take a dip in the natural spring water to conclude our the 60-minute ATV adventure portion of the tour. We turn on the speed of Earth, flying over the river. Feel the wind as you go flying at extreme speeds 200 feet above the river, among the treetops, enjoying the majestic scenery surrounding canopy river. Your tour will conclude with a short ride on the back of a mule. These cute and "flirty" mules are excited to meet you, so book now! Please note: Minimum age to drive is 18 years old. Valid driver's license required. Maximum weight is 265lbs. Transportation to the meeting location is not included. A representative will help you secure a taxi upon arrival. Estimated cost of taxi to meeting location is . This cost is not included. Transportation back to the cruise ship pier is included. Guests must be at least eighteen (18) years old to drive with a valid driver's license. Please wear comfortable closed in shoes and attire. Please note a taxi is required (approximately $10) from the pier to the ATV office and is not included in the cost of the tour. Following completion of the tour you will be returned to the pier by our tour representative.